Learn more about the interesting social life and culture of the Xhosa of the Eastern Cape, South Africa. 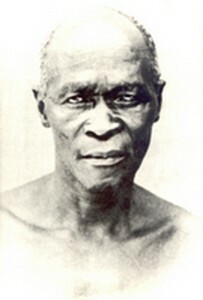 Maqoma was the greatest Xhosa warrior, guerilla general and leader of the nineteenth century. The origins of Enoch Mankayi Sontonga and the hymn he wrote, Nkosi Sikelel' iAfrika, are humble and obscure. Anthropology collects and documents Xhosa traditional knowledge, ranging from artifacts and medicines to myths and rituals. The Amathole Museum is the home of Huberta, the world's most famous hippopotamus. More than seventy five years after her death, young and old are still captivated by the story of her wanderings. Huberta's probable birthplace was in northern KwaZulu Natal. In 1928 she first came to public notice and during the course of her 21/2 year journey, frequently made headline news. Initially dubbed "Billy" by reporters, the name was changed to "Hubert" and her wanderings were followed by the press worldwide. After her death, her name was altered to "Huberta" when it was discovered that she was female. Among the exploits eagerly followed by the public were appearances at Umhlanga Lagoon, in the city of Durban, various South Coast resorts, and a sojourn in the Nahoon River near East London. She became known as South Africa's "national pet" and Initially dubbed "Billy" by reporters, the name was changed to "Hubert" and her wanderings were followed by the press worldwide. After her death, her name was altered to "Huberta" when it was discovered that she was female. Among the exploits eagerly followed by the public were appearances at Umhlanga Lagoon, in the city of Durban, various South Coast resorts, and a sojourn in the Nahoon River near East London. She became known as South Africa's "national pet" and "the Union's most famous tourist". Crowds of curious sightseers dogged her trek along the Kwa-Zulu Natal coast, often hurling stones, bottles and sticks in order to make her emerge from hiding places. . Crowds of curious sightseers dogged her trek along the Kwa-Zulu Natal coast, often hurling stones, bottles and sticks in order to make her emerge from hiding places. On 23 April 1931, her carcass was found floating in the Keiskamma River, 30km from King Williams Town. Great public outrage followed the discovery that Huberta had been killed by a hail of bullets. The killing was discussed in parliament and the police were instructed to investigate. Four farmers eventually appeared in court for killing royal game. Each was fined £25. Huberta's bullet-perforated skull formed a gruesome (and somewhat smelly) exhibit in court. Capt. G.C. Shortridge, Director of the Amathole Museum in King William's Town, took possession of Huberta's remains. The day after hearing news of the shooting at the Keiskamma River, he and his assistant Nicholas Arends took a taxi to the scene. They persuaded a number of local farmers to help in the skinning of the rapidly deteriorating carcass, and finished the task by 11 pm on the 24th April. The next day the hide and skull were taken to King William's Town by bus. While Nicholas Arends laboured at cleaning the remains, curious onlookers trampled the museum's terraced garden and surrounding fence. Sympathy cards and donations for Huberta's mounting poured in. In Verulam flags flew at half mast. The people of Pietermaritzburg sent a magnificent floral wreath in memory of Huberta. Huberta's remains were sent to England for mounting. The cost of that, and of preparing a suitable place for the display of South Africa's favourite hippopotamus, eventually amounted to £159-19-6. Part of that figure was met by the Cape Mercury's Shilling Fund and by special collections organized by the museum. Huberta's wanderings, however, had not yet ended. 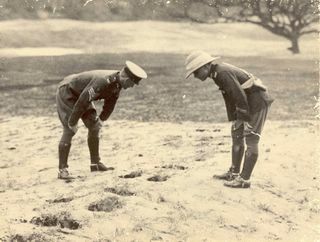 On the hippopotamus' return from London on the S.S. City of Hong Kong, she was displayed at the Durban Museum. An indication of the public's interest can be seen in the attendance figures. The total number of visitors from 12 January to 17 February 1932 was 20,381. In March a temporary exhibition was staged in East London with similar success. Before finally coming to rest in the Amathole Museum,. Huberta had one more trip. After many entreaties from the Witwatersrand Agricultural Society, Capt. Shortridge allowed the mounted hippopotamus to be displayed at the 1932 Rand Easter Show. Thereafter, she was returned to the Amathole Museum, where she is suitably enshrined at the entrance of the old Natural History building. To some Hindus in Kwa-Zulu Natal, Huberta was a protected animal. When she arrived near Annerly on the South Coast, the local Indians are said to have ceremonially deified her. According to contemporary accounts, she was proclaimed "Protector of the Poor" in a service in the Hindu temple. After her death, prayers were again said for her in the temple. To many, Huberta was the home of "a mighty spirit". 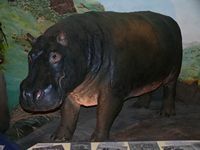 Some Zulus believed the hippopotamus to be the reincarnation of Tshaka. The Mpondo apparently thought her to be the spirit of a famous traditional doctor, descended from a survivor of the wreck of the Grosvenor. Some Xhosa felt the animal was the spirit of a great chief - perhaps even Sandile or Hintsa - who had returned to find justice for his people. In many newspaper stories, Huberta was given human characteristics. While most people were simply amused by her exploits, others were moved to write poetry. After her death, a flood of letters carrying such poetry appeared in the press. Over the years, Huberta has continued to inspire the essays, poems and paintings of countless school children. She has also provided inspiration for artists and musicians as far afield as England and America. 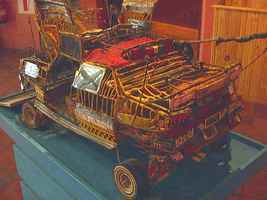 In many ways, Huberta has become synonymous with the Amathole Museum. In April 1999, she was moved for the first time in 67 years to be displayed at SciFest99 (a science festival) for 7 days, attracting 5000 to 8000 visitors. Owing to its predominantly oral character, traditional knowledge is doomed to extinction in a modern hi-tech world in which its poetic language and practical significance are likely to be misunderstood, unless recorded and documented for posterity. Ethnological artifacts are displayed in the XHOSA GALLERY, which documents social and cultural change among the Xhosa of the Eastern Cape from pre-colonial times to the present. The history displays in the museum are designed to show the visitor various aspects of the history of the area, mainly from the 19th Century. The mammal collection is the 2nd biggest in South Africa (after the Transvaal Museum in Pretoria). View this display of most of the mammal species in southern Africa and a few from other parts ofAfrica.